How to Make Your Own Natural Easter Egg Dyes! Did you know that thousands of years ago the ancient Chinese were already dyeing fabric? Or that the Maya in South America created red dye from ground insects? Instead of buying those pre-packaged egg-dye kits this year, why not create your own natural dyes? You have most of the ingredients in your refrigerator and pantry already. Experimenting with various vegetables and spices and turning out eggs that are one-of-a-kind is a great hands-on, multi-age project. Check and make sure that nothing is poisonous, please! You would not want to touch or have your children touch plant parts that are poisonous, and you certainly would not want to put anything poisonous in your cookware. If you do not have a thorough field guide to your local plant life, just stick to vegetables and spices. Depending upon how many eggs you would like to dye and how much material you have – I recommend at least 12-18 uncooked white eggs. It seems over the years that some eggs absorb dye better than others – I am not sure why that would be; does anyone know? IMPORTANT NOTE: Authorities say eggs are not safe to eat if they have been out of the fridge more than two hours after cooking, so keep track of this unless you aren’t going to eat them. Chop (veggies/skins) or mash (berries) each item that needs it and put a cup or more in each saucepan with the egg(s). The typical four burner stove allows four saucepans/dye colors to be done at one time. Measure about two cups of water – or just enough to cover the egg(s) – add one tablespoon of white vinegar for each cup of water. Stir it. Boil the eggs for 20 minutes and turn the heat off or remove pan from burner. Check the color of the eggs. Leave them in the water longer/add more dying material if you would like a deeper value. Leaving three eggs in red cabbage/water overnight (in the fridge) resulted in the gorgeous blue pictured below! Another method is to use the procedure above but without cooking the eggs until you have boiled the material for an hour and strained it. Once the dyeing material has been boiled and removed by straining, use the water to boil the raw eggs for 20 minutes. This probably results in a more solid, uniform color, rather than the “textural” look of our eggs. Perhaps I was too impatient to boil it for an hour…. *Please do not let your kids loose on links without first taking a thorough look – I did not read every word on every page connected to these. When you are done cooking the eggs and you are happy with the color, remove them from the dye water, gently pat dry and refrigerate. The egg carton they came in is a perfect place to keep them. When they have cooled, shine them up with a little vegetable oil to bring out the color. 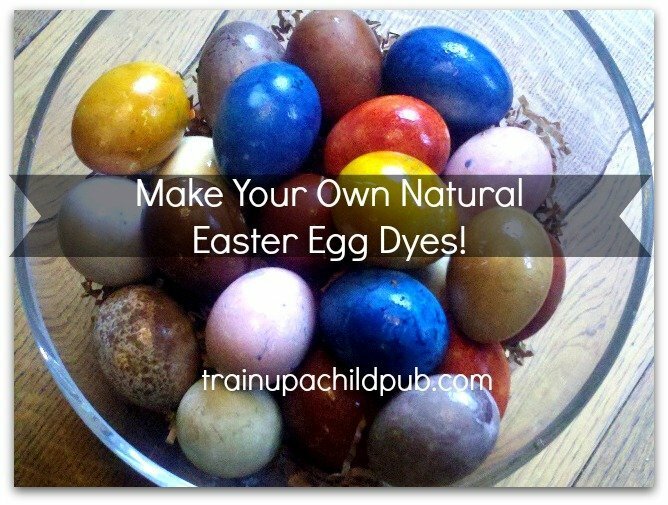 Have you ever dyed your eggs using natural dyes? How did they turn out? Do you have any dyeing material that you particularly like? If you haven’t done this yet, would your kids enjoy this hands on activity?